While the socks are super bright, I rather like the way the colors mix and pool together. It does make for an interesting knit, never know whats coming next. Hand-dyed yarn, a first for me. Went to cast on and discovered I need to reup my sock yarn supply. 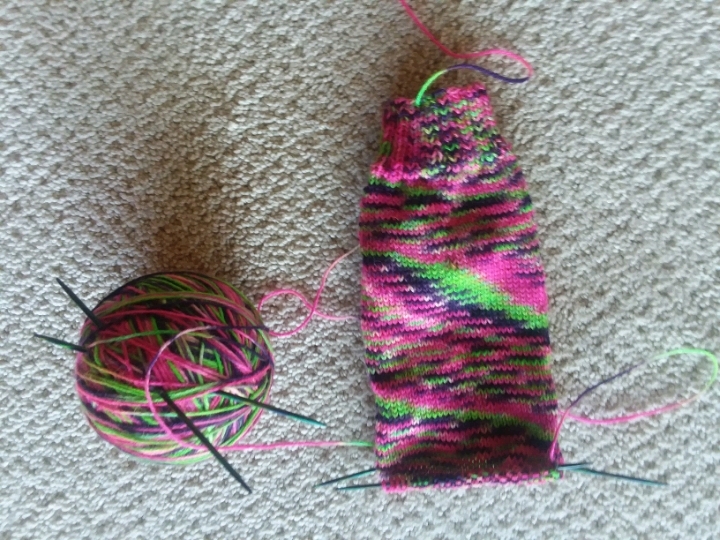 At this point I don't know how to knit anything other than hand-dyed for socks. They're so interesting and pretty. Have you done Fair Isle? My favorite and are you on Ravelry? We could see each others work there. I am mysticmooma there I think. Ah yes! We are friends - I'm eventual. I don't know how good I've been lately about uploading projects. I can't even use two colors in one row very effectively; I was just thinking the other month that I need someone to teach me how to use multiple colors without messing the tension up. I often just cheat and duplicate stitch because it looks like a sloppy mess otherwise. I haven't been on lately either, but do have some of my earlier things up.